When Will Next Five Star Wars Movies Be Released? Star Wars: The Force Awakens is on the way to breaking box office records, but it's got something different about it than other, another recent attempt to bring franchises past and present together. Unlike X-Men: Days of Future Past, the future of Star Wars will still retain the cast and continuity of the original trilogy. And there's already plenty of new movies planned, with two more Episode/trilogy films in the offing and three more spinoff films set in the world of Star Wars over the next five years. Rogue One: A Star Wars Story (December 16, 2016) will take us to a time before Luke Skywalker and Obi-Wan Kenobi first met on Tattoine, giving a behind-the-scenes look at how Princess Leia, R2-D2 and company came to possess the Death Star plans. Described as a "heist" movie, it will be directed by Godzilla's Gareth Edwards and star Felicity Jones, Mads Mikkelsen, Alan Tudyk, Forest Whitaker and more. Star Wars Anthology: Han Solo (May 25, 2018) is the as-yet-untitled solo film set to explore the backstory of everyone's favorite scoundrel and smuggler. Since the Star Wars Expanded Universe has been rendered non-canonical with the Disney acquisition of Lucasfilm, this will be the first "official" glimpse into the character's backstory in the newly-reworked timeline. Directed by Phil Lord and Christopher Miller, Han Solo will reportedly be the final Star Wars movie written by The Empire Strikes Back and The Force Awakens' Lawrence Kasdan. Star Wars Anthology: Boba Fett (2020) is still not officially confirmed, and no creatives are officially on board, although there have been rumors for a while that the bounty hunter would have his own film. 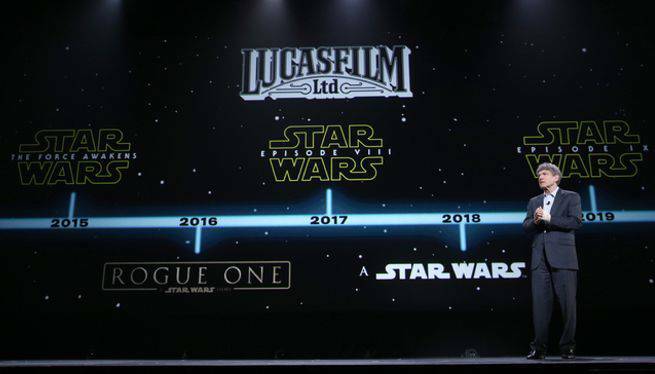 This one would also, plausibly, allow them to tie into Han Solo and/or Rogue One, creating a second, distinct timeline of Star Wars movies being released at the same time as the Episode films -- although that's pure speculation and has not been confirmed or even rumored up to now. Keep your eyes on our franchise movies release schedule for updates.